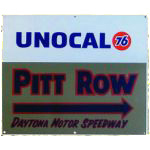 This rare and valuable sign advertises “Unocal 76′,” which is featured against a white background on the top of the sign. Below, the text reads “Pitt Row” in blue, orange-bordered letters. An arrow points to the right. “Daytona Motor Speedway” directs the sign.